I have to admit, I have a hate-on for mosquitoes. Growing up on the prairies, I used to look forward to mosquito-free winters, when the sting came from a lesser evil—frostbite. In the time of West Nile, Zika and other mosquito-borne diseases, dealing with the pests is a serious business. But what’s business without a little fun? It wouldn’t be fair to say that I learned everything I know about business from walking behind a herd of beef cattle. But the experience taught me lessons I still use. My father and uncle operated a mixed grain-livestock farm when I was growing up. They had a herd of approximately 100 Hereford cows, most of which produced a calf in late winter. In early spring, we would drive the cattle seven miles over country roads to a Community Pasture operated by the federal government. The cattle would be boarded at the pasture during the grain-growing season and led back home after harvest. Twice a year I got to follow the herd, on foot, over gravel and dirt roads, across a highway, through ditches and sometimes across fields. It was a great adventure. Looking back, it was also a useful training experience for business, politics and volunteer activities. The herd has a leader. We didn’t lead the cattle—we followed. One of the older cows, which had made the journey several times, headed down the road and the others fell in line. Occasionally, the leader set a pace that was too fast for the calves. At other times, we had to stop the leader from taking a shortcut through a neighbor’s field. On the whole, though, it was a member of the herd that brought the others along. In any group of colleagues—paid or volunteer—I’ve found that there’s always at least one natural leader who instinctively knows where the group should be heading. Working with the natural leaders makes the journey a lot smoother for all concerned. Good relations with neighbors eliminate many problems. Our cattle walked alongside fields belonging to several landowners. Naturally, they were drawn to water or fresh grazing, regardless of who owned the land. My father and uncle were known to be generous with their help, so the landowners did not complain about the odd bit of trampling. In the work world, we experience equipment breakdowns, weather emergencies, illnesses and dozens of other challenges. Working well with neighbors, competitors and suppliers will save us when we least expect that we will need help. Approaching a problem obliquely is usually better than head-on. When a calf or young steer strayed from the herd, it was my job to bring the animal back. It didn’t take long to learn that going straight after the stray would frighten the calf and trigger a long run over rough ground. Approaching obliquely would allow me to gently guide the calf back to the herd. In the working world, the head-on approach may pay off with certain people or in a limited number of situations. Always, it leaves a festering memory and erodes trust. Better to set boundaries and let the “stray” find the way back. Scale matters, until it doesn’t. When the herd arrived at the Community Pasture, the professional cowboys took over. Large holding pens rapidly filled with herds coming from the neighboring farms. The calves were led through a set of chutes to be examined, vaccinated, branded and castrated. The cows were sent through another set of chutes to be examined, vaccinated and tagged. Our herd would have been processed in less than an hour. At home, all those tasks might have taken a couple of days. On the other hand, when the cows needed individual attention during the calving season, my father’s personal touch was irreplaceable. So it is in all things. Matching the method to the need is an underestimated talent. Experience counts. I was on my school’s track team during the last years I tended the herd, so my endurance was better. I could walk or run for long periods without tiring. But physical conditioning wasn’t the major source of improvement in my work. Having traveled that road several times before, I had come to know what to expect. I could anticipate when a calf would stray, pick the right angle to approach it and get it back to the herd with minimal effort. I could position myself ahead of time to direct the lead cow away from the shortcuts. Whether in business, politics or voluntary work, raw skills are helpful but not sufficient. Experience builds the confidence to take on the large tasks and breeds the anticipation that heads off errors and false starts. Walking behind a herd of cattle is about as far away from my current work as I could have imaged on those spring and fall mornings. For one thing, my shoes are cleaner now. The mud and weeds, the persistent bellowing, the occasional cloud of mosquitoes—all these surface details set the herding apart from office work. But beneath it all, the underlying shape of the two experiences has surprising and instructive similarities. The demand for more and distinctive marketing content chews through a writer’s time and energy like a cloud of grasshoppers devouring a wheat field. Calls for tweets, blog posts, LinkedIn updates, landing pages, emails, flyers, ads, RFP responses — they ride in on the west wind and take bite after bite until the content calendar is shredded. The west wind keeps blowing in the grasshoppers, so we need resources that will help us write faster, better, more consistently. Fortunately, there’s good material to be found. Ann Handley’s Everybody Writes fills an important need and should be on every active marketer’s reading list. The book is notable for its generous spirit. Ann Handley not only shares her own experience and advice but shines a spotlight on other resources. In doing so, she has created a reference book that artfully serves as a springboard for writers eager to learn more about their craft. I turn to Part V often. It provides useful tactics for Twitter, Facebook, LinkedIn, email, landing pages, infographics, blog posts and annual reports. A copy of the chart “The Ideal Length for Blog Posts, Podcast, Facebook Posts, Tweets, and Other Marketing Content” sits beside my keyboard. Do the best work you can by the deadline you’ve set, and then consider your writing project finished. Over the years, I’ve learned that no matter what type of work I’m called upon to do, the same rule applies: deadlines are the ultimate constraint. Usually, deadlines are imposed by an external party. In politics, issues have to be dealt with in time to head off bigger problems. If RFP responses aren’t delivered to the purchasing agent by the deadline, the response won’t be opened. In the printing industry, the customer’s deadline sets the scheduling in motion. First there was George Carlin alerting us to the seven words you couldn’t say on TV. Now Coke blocks 3,415 words from user-generated content. An accessory for Coke’s newly launched “Taste the Feeling” global ad campaign, GIF the Feeling is a website that allows visitors to fashion Coke ads by combining a stock clip with user-provided tagline. The result can be posted to social media or downloaded as a GIF—that au courant looping animation image format. What would you say in a Coke ad? Would you describe a positive emotion? Or create digital graffiti? Would you try to use Coke to promote your political cause? Or would you try to subvert the product? Given human nature, more than one person would try to troll, deface, subvert, coarsen or impair the campaign. Hence, the “Profanity API” — a technology intended to ward off foreseeable misuses of the advertiser’s brand. For a thought-provoking review of what is blocked and why a company would subject its brand to so many potential indignities, check out Ian Bogost’s fine article in The Atlantic. Incidentally, I’ve seen at first hand what can happen when a “profanity API” is not in place. Years ago, I was part of a team that provided services for a telecom manufacturer. We had been invited to discuss integrating some of our services with a business card ordering system the manufacturer had purchased. Our host beamed as he showed us the easy-order feature which eliminated the need for HR staff to approve the content of the card. His face darkened — from a mix of embarrassment and anger — when he opened the dashboard to show us the cards that had been requested. In more than 70 instances, employees had entered the CEO’s name and assigned him a derogatory job title. More recently, I worked on a project for a cell phone reseller which aimed a product at the teen and young adult market. Customers were invited to manage their account online and leave brief testimonials about the product. You can guess what happened. When we received the data file for a mailing, we discovered that offensive or derogatory comments littered not only the comments field but also the address fields in a high percentage of the records. User-generated content is a rough neighborhood. Hats off to Coca-Cola and other brands who venture out, trusting in their “profanity API”. Can anyone win the name game? You know the one I mean. You’re at an event and a friend introduces you to someone. Your friend lobs the name to you like a hanging curve ball, expecting you to hit it out of the park. Whiff! The name flits past you and the umpire rings you up. Another failed connection! If you’ve experienced this, you’re in good company. Forgetting names is one of the three most common getting-to-know-you problems people have, according to Keith Rollag in the December 2015 issue of Harvard Business Review. The others are—you guessed it—hesitating to introduce yourself and failing to ask questions. It’s the “names challenge” that interests me. Some jobs just demand that ability. For example, how do the good politicians and priests keep their mental Rolodex up-to-date? The politicians remember their constituents and the priests put a name to each sheep in their flock. Do they have skill or talent? Or help from above? Rollag advises us to work at it: say the name in conversation right after hearing it; write it down as soon as you can and review your notes until the name is locked in; and, of course, create a vivid image to link the name with an unforgettable object or situation. Picture Rock Hudson as a giant boulder dropped into a river, with the New York City skyline in the background. Can this advice work? Seeing is believing, so I’ve long been a believer. In the summer of 1972, I took a course in Canadian history from Dr. Bev Koester. As the students straggled into the classroom for the first session, he studied us without uttering a word. When everyone was seated, he began to take attendance. “Mr. Williams,” followed by long seconds of silent scrutiny. “Mr. Goski.” More silent scrutiny. The methodical roll call resumed in the second and third sessions. From then on, he used our names without hesitation or error, regardless of where we sat. A year later, I took another class from him and was greeted with “It’s good to see you again, Mr. Goski” as I entered the classroom. After an interval as a spell-binding lecturer at the University of Regina, Bev Koester went on to become Clerk of the House of Commons, where he duly mastered the names and constituencies of 282 Members of Parliament. By then, I was working on Parliament Hill and would watch in admiration as he handled the standing votes: “The Honourable Member from Glengarry—Prescott—Russell, The Honourable Member from Kenora—Rainy River, The Honourable Member from Assiniboia” and so on, until the roll had been called. How many hours had he spent, poring over lists and pictures of the Members, linking their names and constituencies to the faces? I don’t know, but I’m reasonably sure he had the memory work done before newly-elected Members even came within view of the Parliament Buildings. So yes, we can win the name game. It takes desire, will and practice. Judging how clearly I remember my reaction when my name was called out by Dr. Koester after the interval of a year, the effort is worthwhile. It’s been just over a week since Elizabeth May’s sad performance at the Press Gallery dinner. You remember the one: F-bombs masquerading as toughness; incoherent mini- lectures about the hobbyhorse of the moment; lauding a grenade-thrower and smearing the entire federal cabinet in a juvenile turn of phrase. Surely the political damage is severe. If one of the other parties chooses to run an election commercial against the Greens, it’s bound to become an instant classic. A waste of money, but a classic. Hats off to Lisa Raitt, who had the courage to mount the platform to rescue her friend from herself. The sight of Ms Raitt shepherding and consoling Ms May while being denounced as classless by Ms May should linger in our memories. Anyone would be lucky to have such a stout-hearted friend. I was startled to hear the slogan “smooth as hell” in a liquor commercial during prime time this week. Not offended, mind you. Just startled that a copywriter could get away with a slogan that sounds like a fourteen-year old trying on a bad-boy act. Daffy Duck sashaying into a saloon and asking for sarsaparilla in a dirty glass sounds more authentic. Checking out coverage of the National March for Life on Parliament Hill, I came across a tweet that featured a couple of grinning women carrying signs that read “Life is overrated” and “I hate life.” Really? In your heart of hearts – really? Should you do your “due diligence” or your “do diligence” when you set out to buy something more expensive than a box of Oreo cookies? Christina Desmarais has the answer to that question and 19 others in an instructive article every business writer should scan. She cites errors found on websites belonging to Oxford University, the BBC, the White House, the New York Times and other high-profile organizations. Her examples may peak — I mean pique — your interest and save you from a minor embarrassment. She notes that many of the errors won’t be caught by a spell checker. To test that comment, I used her examples in a Word 2013 document. The grammar checker identified only seven errors; it missed “shoe-in” and “sneak peak.” It’s enough to disrupt anyone’s piece peace of mind. So you think surveillance is oppressive today? In recent weeks, the public has learned a lot about the extent of surveillance in our post-9/11 world. The Guardian’s story about the NSA’s activities set off a frenzy of speculation and comment. Naturally, Orwell was invoked by many commentators and Huxley by a few. My own thoughts turned to the small town where I grew up, to the intense and personal surveillance that did so much to knit the community together. I spent my childhood and teenage years in a Western Canadian hamlet that was home to about 45 people. The surrounding farming population had already begun to dwindle as farms grew larger and families smaller. It was an intimate setting, where joy and pain were shared and no one made the mistake of thinking they were invisible to their neighbors. The region had been settled for 60 years, so the families in the area had at least two generations of memories about each other. They remembered the hopeful years of early settlement, the near-despair of the Hungry Thirties, the worry and deprivation during WWII, the arrival of electricity in the 50’s and 60’s. And they remembered the courtships, births and deaths, community dances, rowdy brawls, sports days, church events and political campaigns that provided the context for our lives. Everyone had a history, and everyone else knew a good part of it. Phone service was a party line. It was prudent to assume that no conversations was private. Fortunately, you knew who was listening. Farmers’ fields were always open to inspection by their neighbors. On a relaxing Sunday drive through the neighborhood, anyone could see who wasn’t keeping their weeds down, who’s furrows weren’t straight, who’s harvest hadn’t been taken in quickly enough. Since most of the grain was sold through the Wheat Board, with controlled quotas and pricing, everyone could estimate their neighbor’s income with a high degree of precision. Most farmyards were open to view from various angles. At least one person I knew used a strong set of binoculars to keep tabs on nearby farms from her kitchen window. The weekly newspaper in the nearby small city ran a social column about each of the hamlets in the region. Wednesdays brought a fresh batch of reports of Sunday visits, anniversaries, and various milestones, published for all to see. Was this communal life unstintingly painful? Not at all. For every inconvenience or intrusion, there was at least one offsetting gain. The deep knowledge of one’s history conferred an undeniable dignity on each person; however frayed the bond, we belonged in each others’ lives. The party line was a lifeline which informed the entire community instantly whenever fire, accident or bereavement struck. Farmers who were struggling because of ill health did not have to ask for help because the need was evident in the state of their fields. The financial pain of depressed prices or hail-damaged crops was shared by all. No one grieved, worried or celebrated alone. The surveillance was real, intimate, and omnipresent. In that corner of the world, it was more penetrating than today’s anonymous monitoring of emails, phone calls and Facebook posts. On balance, it contributed to a more intense social life which is preferable to the anomie currently endured by so many in urban centers. If you want to see what a digital mob looks like, try following a Twitter hash tag as an emotional event occurs. 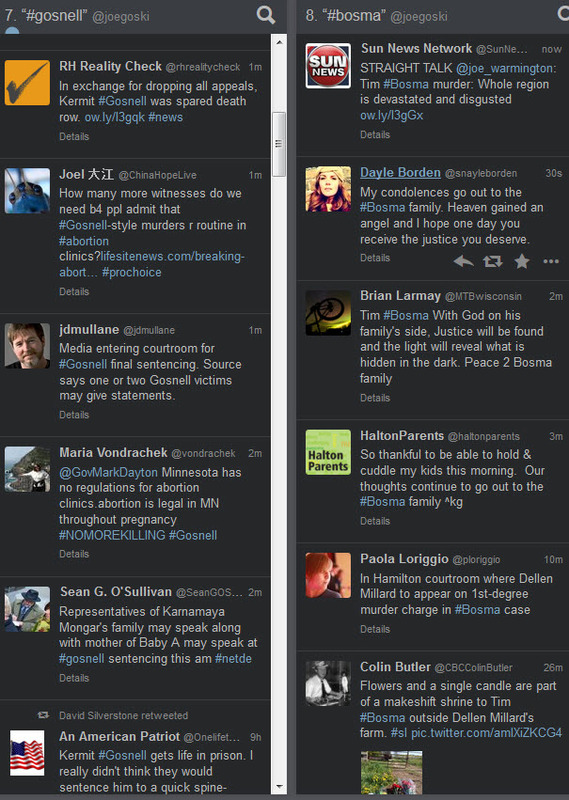 This week, I followed the hash tag #gosnell when word broke that the jury was about to return a verdict in a sensational trial after several days of deliberations. Kermit Gosnell, a doctor in Philadelphia who had operated an abortion clinic accurately described as a house of horrors, was accused of brutally killing babies who had been delivered alive. The jury found him guilty on multiple charges; a hasty plea deal resulted in consecutive life sentences. The damburst of tweets began immediately after the announcement that the jury had reached a verdict. The tweets appeared and ran down the timeline so quickly I could barely make out the words. In the hour that passed before the verdict became known, the flow of tweets accelerated as comments incited others to comment, in a cascading effect. Given the nature of the accusations and the disgusting details that had been made public during the trial, it’s no surprise that many of the comments were harsh in the extreme, demanding retribution. As soon as one reporter announced a summary of the verdict—guilty on three first degree murder charges—the detail was echoed in thousands of tweets per minute. I also followed the hash tag #bosma when it was announced that an arrest had been made in the case of the disappearance of Tim Bosma, a young Canadian man who had fallen among thieves. The flow, proportionally slower than the Gosnell flow, still ran at a fast pace for hours. At the peak of the flow, my eye could make out only random words from a message as it slipped down the page; because of the density of messages, the random words built of coherent picture of the prevailing sentiment. The topic could shift and reorient like a flock of swallows; as soon as a fact or rumour was reported, the follow-up tweets absorbed and built on it. Twitter was ahead of the main news outlets by several minutes; presumably, the process of verifying information and composing readable dispatches accounts for the difference in timing. The tweets on these occasions were expressions of emotions, not eye-witness accounts of unfolding events, so they contributed very little to the understanding of the events. In both cases, Twitter’s main strength—immediacy—was negated by the sheer volume of tweets. So many people commented that no one could read the messages as they sped by; it would take a software solution to count and categorize the sentiments and expose the various threads of argument and commentary. Given the nature of the events being commented upon, it shouldn’t be surprising that the nasty comments demanding retribution were the most prominent. Comparatively few spoke of mercy for the accused. The flow of tweets has been likened to a fire hose; in this case, it would have taken a fire hose to wash away to stain of anger and nastiness that spread with the succession of comments. How short is short enough? Donald Trump, the second coming of who?